On June 27th 1787, amid much ceremony, the Theatre Royal Margate opened it's doors for the first time. The first performances were "She Stoops to Conquer" and "All the Worlds a Stage". Below is part of the story leading up to the opening of Kent's oldest theatre. During the reign of King George III, Francis Cobb was a very influential Margate businessman; he was the landlord of the 'Fountain Inn', Kings Street, Margate as well as the head of Cobbs Brewery. Situated at the rear of the Fountain Inn was a stable that was being used as a theatre. This was rented to a retired Sea Captain called Charles Mate who already had control of a theatre in Dover. The cost of rent was £20 per year. Charles Mate decided to invest £200 and opened a new theatre on this site. A passage written around this time gives a good description of the atmosphere of the theatre: "Notwithstanding the neighing of horses and yelping of dogs in the stable, over which the stage was built, the place overflowed with the best company. But the most remarkable part of the business was that the performers came to the front of the house in the public street in their tragic and comic robes with powdered heads and painted faces til they had a sufficient number of auditors to pay their nights expenses. It was like the circus procession of later times." Sarah Baker, a woman from a theatrical background, was England's first woman theatre manager, she had brought her Company to Dover and in 1785 she approached Mr. Cobb and sought of him permission to open a theatre in Margate. Mr. Cobb however refused her request. Sarah was intent on having a theatre in Margate and subsequently in just over a month she had a wooden theatre erected at a cost of £500. Sarah opened for her summer season in July, the same month that Mr. Charles Mate opened his season. After three months, Mate found the competition too strong. Having lost interest and money in his theatrical venture in Margate he returned to his theatre in Dover. Mr. Cobb was not best pleased with Sarah Baker. Local townsfolk, under the influence of Cobb, sent a petition with over 900 signatures to parliament, requesting a Royal Charter. The 'Margate Playhouse Bill' was introduced and the Royal Charter was awarded, the licensee would have the power to send Mrs. Baker back to Dover and prevent other rival Companies from invading Margate. The licensee would be permitted to give dramatic performances there from 1st May to October 31st every year and permitted to sell alcoholic drinks for 24 hours daily. The permit remained valid for one hundred and twenty five years! Good news indeed for Cobbs Brewery. Charles Mate decided that he wanted to try again in Margate, so he formed a partnership with Mr. Thomas Robson, a singer from Covent Gardens, London. Charles Mate’s former Margate theatre was re-opened and renamed the 'Theatre Royal'. Both these men had ambitious plans to succeed in Margate and towards the end of 1786, their co-owned 'Theatre Royal' was closed and preparations were made for the building of a new theatre. The new site of the proposed theatre was to be on the East side of Hawley Square at the junction of Prince's Street, (now known as Addington Street). The land belonged to an estate and was purchased for the princely sum of £80. The cost of the theatre was approximately £4000. The 'flies' above the stage were built from ship timbers. Whether or not they are from Charles Mate's ship is not known. The first stone was set down on the 21st September 1786 and the following inscription was on it, "This is the first stone of the Theatre Royal laid in due form and attended by the brethren of Thanet Lodge, by the proprietors, Thomas Robson and Chas. Mate, on the 21st of September, 1786, on the reign of Geo.III" Thomas Robson built for himself a dwelling on the west side of the theatre (some of the interior is still visible today) with the parlour being used as a box office and treasury. 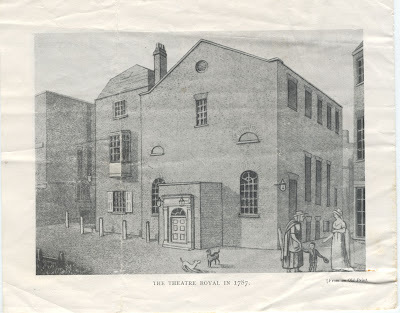 On June 27th 1787, amid much ceremony, the Theatre Royal was opened. The first performances were "She Stoops to Conquer" and "All the Worlds a Stage" in which Charles Mate played the part of 'Diggory' - a character who paradoxically fancied himself as an actor! As of Mrs. Baker, her theatre building was carefully taken apart, transported by sea to Faversham, re-built and became part of the Canterbury Circuit. 230 years on, the Theatre Royal still survives, even though, sadly it celebrated this milestone silently, as at the time it was closed after being purchased by the local Thanet Council. Happy Birthday old girl, and here's to another 230 years! My gt gt gt gt grandfather- George Scotcher was an actor and friend of Charles Mate and mentions him in his diary of 1796.